The shower gel I am about to review is a free from product rather than 100% natural. I want to be up front and explain that it is heavy with preservatives. That being said I have been advised that it is not the worst product in terms of the composition of ingredients but there are better alternatives. If you are looking to reduce toxins in your skin care you may wish to consider this product but honestly I do feel that 100% natural skincare is the better option for sensitive skins. Etie'no skincare is free from SLS, parabens and artificial colours & fragrances. I was sent Ylang-Ylang and Patchouli Shower Gel to review. With the help of EWG's Skin Deep Cosmetic Database, I added explanations of to the ingredients list below so you can make up your own mind about this product. Ammonium Laureth Sulphate – Although this sounds like SLS it is different and does not have the same potential to irritate the skin, it is considered a milder & safer alternative to SLS. Iodopropynyl butylcarbamate - a restricted preservative, it is acutely toxic by inhalation and should not be used in products that can be aerosolized or inhaled. Now let me focus on my review. The packaging is simple but attractive and suitable for its purpose. This shower gel has a pearl colour and a thick consistency. Ylang-Ylang is a rich exotic, floral scent. It is believed to relieve high blood pressure, normalise sebum secretion for skin problems and is considered to be an aphrodisiac. I find this fragrance interesting, slightly heavy but not over powering. 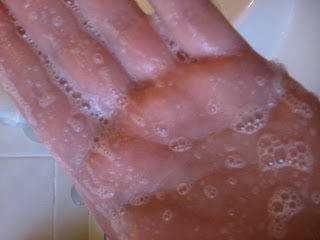 The picture below demonstrates the lather achieved when rubbing directly onto my hand. 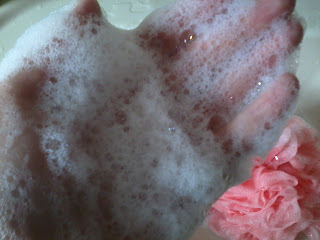 If you use the gel on a bath puff then the lather does improve. Do remember that if you live in a hard water area this can sometimes affect the suds. 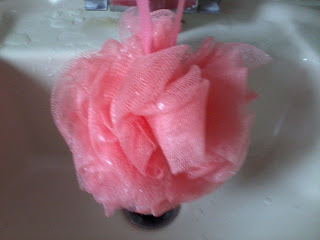 By the way, the picture below illustrates what I mean when I say bath/shower puff. I have noticed some people refer to them as a loofah but loofahs in my mind are hard sponges on a wooden handle. Etie'no shower gel retails at £7 for a 250ml bottle. Other fragrances are available - Grapefruit, Geranium & Ginger and Lemongrass & Patchouli. On the website you can also find a selection of face products, scrubs, body butters and handmade soaps. Disclaimer - I was sent this product free of charge, I am not being paid for this review, links in this post are not affiliated, all thoughts are my own.